It’s hard not to be overwhelmed by the choices as you walk down a lighting aisle at your local home store. 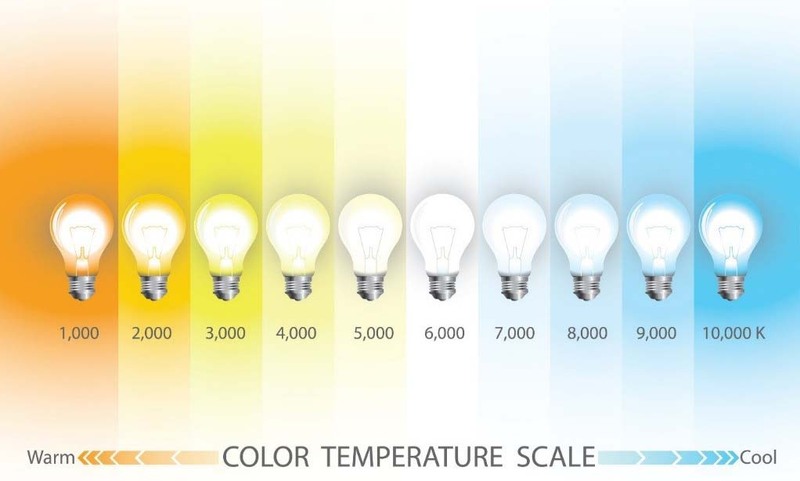 There are many options, and the days of shopping for a bulb based on simple wattage and a “Warm" or “Cool White” designation has changed forever with high efficiency lighting. Because we get more light out of less wattage, shopping for bulbs based on watts is no longer a reliable method to achieve satisfaction with your purchase. Let’s break it down for you in the simplest of terms. When shopping for bulbs look for these things: Fixture and Bulb Type, Lumens and Color. The Parabolic Aluminized Reflector (PAR) style bulb, which is used mostly in can or recessed fixtures, directs light mostly downward. Think about the difference between a torch and a flashlight. Putting an A style bulb in a recessed can or a PAR style in a table lamp may not put the light where you want it most. LED’s are now available for most bases and bulb styles. Lumens – The amount of light you get from the bulb. See the chart below for Wattage to Lumen comparisons with different bulb types. Color – The more precise description of color previously referred to as warm or cool white is the Kelvin (K) measurement. The old standard incandescent bulb burned at about 2700K. This is often more of a matter of preference and will not be the same for all people and all applications. Energy savings – More lumens per watt results in more light with less energy; this is going to result in energy savings. An LED (Light-Emitting Diode) bulb compared to a standard incandescent bulb may use only 20% of the energy and produce equal or better light. Service life – The service life of most incandescent bulbs is measured in months. 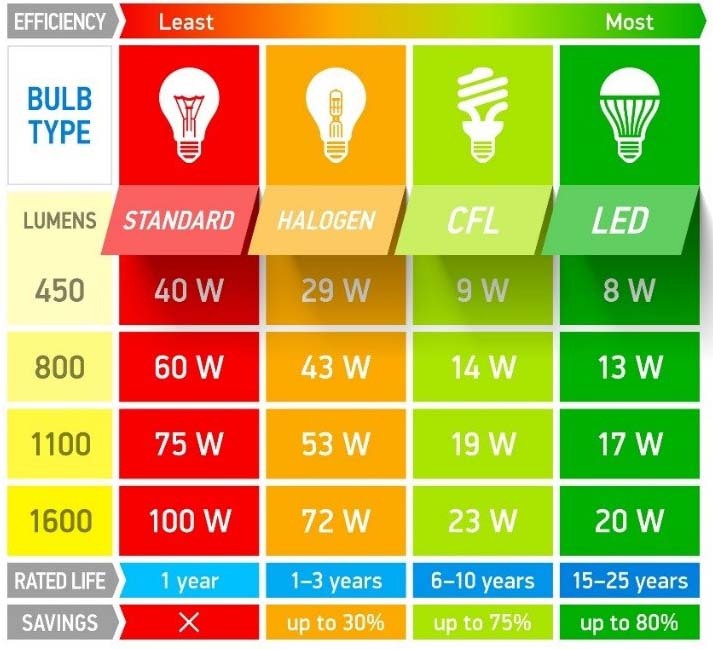 With the entry of Compact Fluorescent Light bulbs (CFL’s) to the market, the service life of bulbs extended to five or more years, and now LED’s are achieving even longer lifespans. Dimming – You still need to check the labels but most LED bulbs are dimmable. LED Fixtures – When shopping for fixtures, note that many LED fixtures do not have replaceable bulbs. However, most standard fixtures accept LED options very well. Smart LED Bulbs - Can’t decide on a bulb color you like, or confused about how many lumens are appropriate for an application? You might want to try a smart LED bulb. Many of these can dimmed and color tuned to your preference; you can then use this data to shop for more bulbs. Smart LED bulbs can also be accessed remotely and/or programmed to come on and off when you are away to simulate occupancy or to prevent coming home to a dark house. Quality – Not all LED’s are created equally. The easy way to spot a quality LED is to look for the Energy Star® Label. These bulbs hold up to high standards and undergo rigorous testing. Bulb service life and warranty are other indicators of bulb quality.